Haviland Crater is an elliptical, funnel shaped meteorite impact pit measuring approximately 10.7 by 17 meters. It is located at 37° 34’ 57” North latitude, 99° 09’ 49” West longitude (Hodge, 1979), in farmland, in Kiowa County, Kansas, and is best known for its association with the Brenham Pallasite (also published as the Hopewell Mounds meteorite), a Pallasite, PMG-an (Buchwald, 1975). The primary description of the site is Nininger and Figgins (1933)﻿, based on its 1929 excavation. 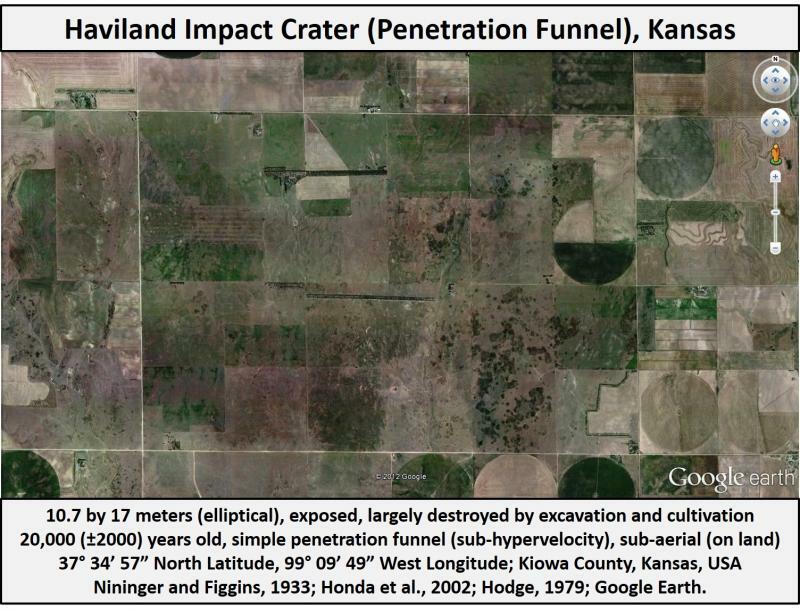 Unlike all of the other confirmed impact craters listed on this website, Haviland is most likely a penetration funnel, rather than an explosively excavated impact crater. This means that it probably resulted from a sub-hypervelocity impact of the associated pallasite, on the order of a few hundred meters per second, rather than from a hypervelocity impact at a speed of kilometers per second. If this is the case, Haviland differs significantly in the physics of its formation compared to larger craters. Contrary to the complex mechanics of hypervelocity impacts, where explosive excavation occurs behind a passing shock wave traveling faster than the speed of sound in the target material, small penetration funnels such as this form in exactly the manner that one might intuitively imagine. An object hits the ground and the surrounding soil and rocks are directly accelerated outward by the imparted impact energy or by a resulting acoustic wave. The process is essentially the same as one would create by throwing a rock into mud. This low impact energy, which resulted from the slowing of the inbound meteorite by the atmosphere, is exactly what allowed the meteorite associated with this event to survive. Haviland is one of only three major impact craters/funnels in the US that are associated with intact meteorite fragments. The others, which are both explosive craters associated with hypervelocity impacts, are Barringer and Odessa. Nininger and Figgins (1933) put forth a multiple impactor scenario, based on the distribution of recovered meteorite material within the funnel. They argued that the 15 meter pit was formed by the impact of several smaller meteorites in close proximity, rather than a single larger one. The viability of such and argument is supported by more recent descriptions of an analogous scenario at the largest crater or funnel at Sikhote Alin, Russia, recorded in Krinov (1971) and LaPaz (1949). Honda et al. (2002) offer an age for Haviland of about 20,000 (±2﻿000) years, based on the terrestrial age of the associated meteorite. Though Haviland 'crater' was formed by a meteorite and was found containing fragments of the impactor, it is probably not a hypervelocity impact crater, but rather a penetration funnel. No diagnostic shock evidence exists. Though sub-hypervelocity impact funnels like this are generally excluded from catalogs of impact craters, Haviland has often been an exception, first because it was one of the earliest (and only) impact funnels to be excavated and described in significant detail, and secondly because it falls within a size and age range in which the mechanics of its formation cannot be known with certainty. Significant evidence of impact origin: meteorite fragments and morphology. Evans, K., Click, K., Mickus, K. and Snyder, R., 2007, Ground-penetrating radar imagery of Haviland crater, Kansas: Anatomy of a partially excavated meteorite impact site: to be presented to GSA national meeting, Denver. Hodge, P. W. 1979. Meteoritic material in the soil near two meteorite craters (abstract). Meteoritics, v. 14, number 2, pp. 422-423. Hodge, P. W., The location of the site of the Haviland meteorite crater (abstract). Meteoritics, v. 14, pp. 233-234. 1979. Honda M., Caffee M. W., Miura Y. N., Nagai H., Nagao K., and Nishiizumi K. 2002. Cosmogenic nuclides in the Brenham pallasite. Meteoritics & Planetary Science 37:1711-1728. Merriam D. F. 2011. Topographic depressions on the High Plains of Western Kansas. Transactions of the Kansas Academy of Science (1903-), Vol. 114, No. 1/2, pp. 69-76﻿. Merriam D. F. and Harbaugh J. W. 2007. Meteorites and Possible Meteorite Impact Features in Kansas. Transactions of the Kansas Academy of Science, Vol. 110, No. 1/2, pp. 61-68. Nininger H. H. 1949. Kansas Meteorite Discoveries 1837-1948. Transactions of the Kansas Academy of Science, Vol. 52, No. 1, pp. 110-112﻿. Nininger, H. H., and J. D. Figgins. 1933. "The Excavation of a Meteorite Crater Near Haviland, Kiowa County, Kansas." Proceedings of the Colorado Museum of Natural History. 12. No 3, 9-16. Peck, E., The fate of a Kansas meteorite crater. Sky and Telescope, v. 58, pp. 126-128. 1979.